The Beit Halochem Center in Haifa was opened in 1986. The “Brith Sholom Foundation in Philadelphia” undertook the major portion of the facility’s funding. Because of its unusual architectural features, it is considered one of Israel’s more unique buildings. 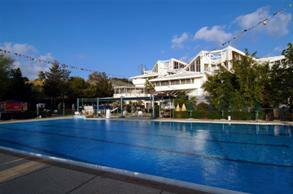 Situated on the western slopes of the French Carmel, the complex covers about 7,500 sq. meters. The three-story building houses a social wing, 180-seat auditorium, multipurpose gymnasium, classrooms, fitness rooms, indoor and outdoor swimming pool, a hydrotherapy pool, shooting gallery, cafeteria and offices. Over 2,700 disabled veterans who live in the north make up the active membership, with a total of 6,500 participating members, families included.